Vanessa and I finally took that cruise. Many people have told us often that we should take a cruise…”it will be fun”…”it will be special”…”you’ll enjoy it”…were all the things people were saying to us…oh, and…”you’ll love the food!” So, for our 36th anniversary we signed up and went on a cruise. 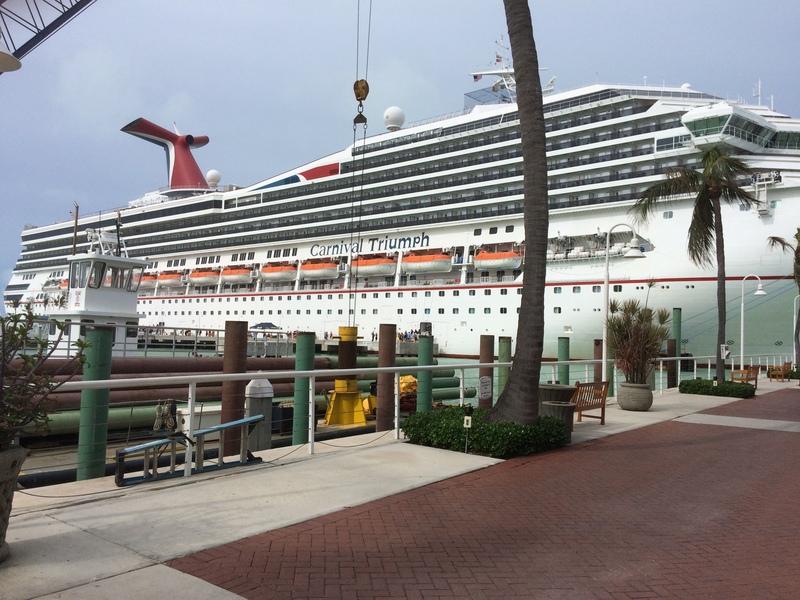 We opted for a four-day western Caribbean cruise out of New Orleans on the Carnival Triumph. We figured we could do anything for four days, but we didn’t want to sign up for longer in case we didn’t like cruising. For me, four days was plenty. I’m a glass-half-empty kinda’ guy. Yeah, I know…Christians aren’t supposed to be that way, but I guess I haven’t allowed the Holy Spirit to do His regenerating work in my life in that area, so I should probably warn you not to let my experience taint your love for cruising, or your desire to explore the opportunity for yourself. I’m writing only because many folks have asked me, “How was your cruise?” Rather than telling the same story anytime someone asks, I can simply say, “Read my blog.” So, here’s my glass-half-empty view of cruising. First, I have to ask, “Who even takes a cruise in a hurricane?” Apparently, Vanessa and I do, and I don’t suppose a hurricane has ever stopped Carnival Cruise Lines from leaving port. Hurricane Nate was making his way across the western Caribbean just as we were getting ready to leave New Orleans. Carnival was good to keep us updated, and we found out just prior to boarding the ship that ours would be a cruise to nowhere. We were originally headed to Cozumel, but Nate was sitting right over the Yucatan Peninsula that morning. Great! Our first cruise and it’s going nowhere! Now, for the glass-half-full part–Carnival agreed to refund 50% of our cost and give us a 50% discount on any future cruise for which we might sign up. Can’t beat that for generosity! I’ll applaud Carnival. The customer service was excellent. The accommodations were first class. The ship was CLEAN! Everywhere you went on board ship, someone was busy cleaning something. The entertainment was professional and the shows enjoyable (if you’re into that kind of thing). Something else I discovered about cruises: If you don’t drink (to excess), don’t dance or don’t gamble, there’s only one thing left to do and that’s eat, and even eating gets old after four days. The food was one of the reasons we were told we should take a cruise. Well, either they don’t know what good food is, or we don’t. Oh, the food was okay, but it wasn’t great..certainly not great enough to gorge yourself three times a day, but with little else to do, Vanessa and I took the Ray Barone philosophy of cruising (Google “Ray cruises with Marie”), which is to just eat all the time. That, my friend, is an evil philosophy. I either now have to buy new clothes or go on a diet. After the cruise, I can’t afford the one and don’t want to do the other. Speaking of drinking, why would anyone drink alcohol on a cruise? With the waves rocking the ship, you can stumble your way anywhere on board. You get the effect of drinking without the cost, either financially or physically…unless you get seasick (I did not!). Something else I discovered? Key West, Florida is nowhere. We left New Orleans on a cruise to nowhere and ended up in Key West. I suppose that’s another glass-half-full occurrence, after all. Key West (for me) was the highlight of the trip. Simply put, four days on a rocking (and not in the good way) boat was not shaping up to me to be much fun, but when the captain informed us they had made arrangements to port in Key West, I brightened up. 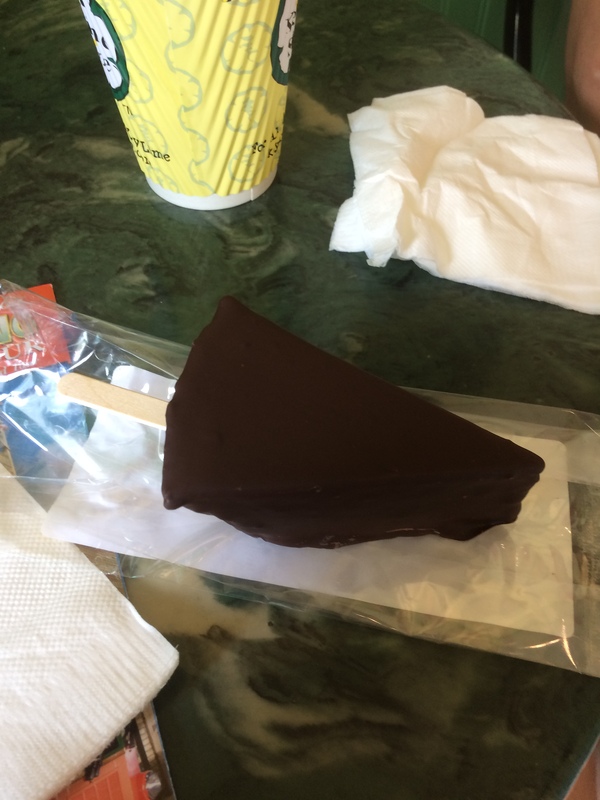 I’d never been to Key West before, and I can say that six hours wasn’t nearly enough time to do all we wanted to do, although the cuban sandwich we had a Pepe’s was fantastic (best meal I had on the trip…and I had to pay extra for it) and the chocolate dipped frozen key lime pie from Kermit’s was worth every penny I paid! Lest I be too pessimistic in my assessment, cruising was a new experience. One I can check off my “to-do list” now. New experiences are always fun, and it was a trip for our 36th anniversary, so that made it meaningful. Even with a 50% refund and a 50% discount on our next cruise, I’d rather have spent four days lying on the beach somewhere, though with a hurricane in the Gulf there was no guarantee of the weather there either. I suppose four days in the mountains would have sufficed,too. As for cruising, I can say, “Been there, done that! Didn’t buy the t-shirt.” But please, don’t let that affect your impression of cruising. After all, I’m a glass-half-empty kinda’ guy.